Krishna also provides protection to the mundane cows of this world, but in an indirect way. For their protection he establishes the principles of religion and the Vedic culture. Krishna is the protector of dharma (religion), but in order to accomodate the free will of the living entities, sometimes He allows dharma to become degraded, and as a result the cows (and the entire world) are mistreated. At such a time, the Lord will incarnate to reestablish the principles of religion. Of course the true protection the Lord gives his devotees goes much beyond this. He does not protect us from death, He actually protects us from life – life in this material existence. People with a very limited vision of existence think death is our enemy, and we must prolong this life as much as possible. But those with a spiritual vision understand that the soul is eternal, and he will continue his journey in his next body. As such, our need no longer becomes protection from death, as death is nothing more than a passing phase of one body. We actually need to be protected from this life and attachment to its false bodily possessions. The Lord’s protection is absolute. He is protecting each and everyone of us. Some people he protects from death, other’s he protects from life. In both cases He is protecting them, because he is seeing to the protection of their eternal soul, and not just their external body. The entire material creation is for the protection of the living entities. Krishna is drawing us back towards His spiritual abode. From the perspective of eternal time, one life span, or even a thousand life spans, are not very significant. The actual purpose of the Lord’s incarnations is to reclaim the fallen conditioned souls through His transcendental association. This is the Lord’s true protection, which he gives very freely to the cows of Vrindavana. 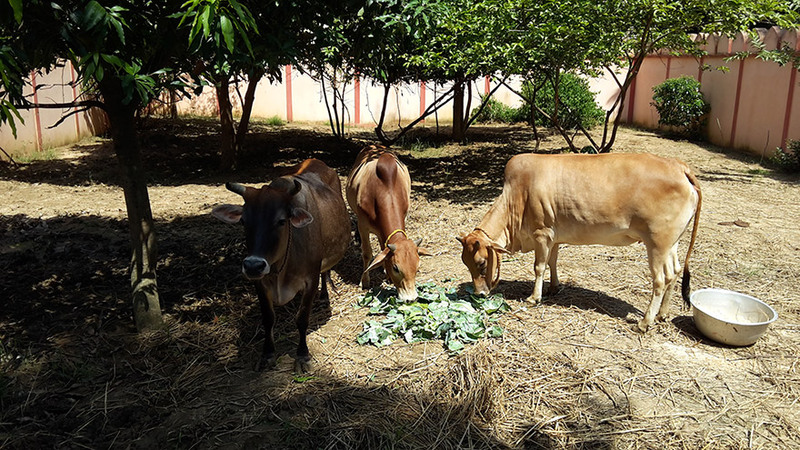 in addition to our cultural and sanatan dharm devotion to cows, modern science is also realizing the significance cows and cow based organic agriculture and vegetarianism for sustainability of environments, health & nutrition of humanity. It is also being realized India was the richest country in the world when our cow population was equal to human population. Social & economic decline of India has been in direct proportion to the number of cows related to population. With complete ban on cow slaughter and larger growing number of cows more prosperous and healthy Indian society will be.